The Spring 2019 issue of North American Whitetail magazine. DENVER (January 22, 2019) – There is an official entry score for a pending world record hunter-taken non-typical white-tailed deer. 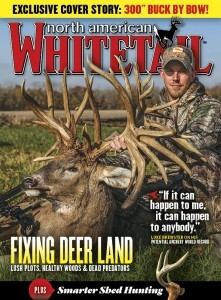 The Illinois behemoth buck will be featured on the cover of the Spring 2019 issue of North American Whitetail magazine. The new contender for the title has come to be referred to as the “Brewster Buck” after Luke Brewster, the man who harvested the incredible whitetail while bowhunting on November 2, 2018. The Brewster Buck has an official net entry score of 320 5/8”. That’s enough to topple the Pope & Young non-typical world record (Mike Beatty, 294”, Ohio, 2000) and the Boone & Crockett hunter-taken non-typical world record (Stephen Tucker, 312”, Tennessee, 2016). Luke Brewster’s buck will be subjected to final panel scoring by both the Boone & Crockett and Pope & Young clubs before the 60-day entry score can be made official, though a date for the panel has not yet been released. Brewster was on hand to present the world-class buck to the excited crowd at the 2019 Archery Trade Association (ATA) trade show, along with North American Whitetail editor in chief Gordon Whittington and associate editor Haynes Shelton. The “Brewster Buck” became the highlight of the first day of the trade show, as the buck’s massive rack sent patrons into a frenzy.